Another end to a month and another selection of exciting products on offer from VioVet. This month we have seen a new selection of dog toys available from Kong, which always prove to be a popular choice with many of our customers. 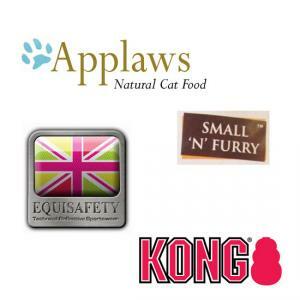 Applaws have released a new range of wet cat food to add to their tasty and nutritious natural food selections. We have added some products from Equisafety which help to keep you and your horse seen in low light conditions, and for our small animal owners, we have a huge amount of cage accessories and toys from Small 'N' Fluffy which includes a number of unique items for your pet to get involved with. Kong are a popular brand of dog and cat toys which have been made from high quality materials to ensure they last, even with the toughest of chewers. Starting off with the rubber Classic Kong, which was invented due to a retired police dog's destructive chewing habits, the catalogue of toys has grown and grown with each production being a popular choice in the dog toy market. The latest releases which have just been added to VioVet are the Ballistic Fire Hose range. Each one is made from tough fire hose material which has been made to last. Perfect for dogs that chew any old toy to bits within minutes, each Ballistic Fire Hose is suited to stand up to whatever your dog can throw at it. There are seven choices available, each of which is suited for tugging, chewing and fetching games, and they float too so can be great for your dog if they love a swim. We have mentioned previously when there have been new products released from Applaws, mostly because they always contain highly nutritious ingredients, and due to the fact that dogs and cats love the taste. The entire Applaws selection in 100% natural, with nothing added that your pet doesn't want or need. That's not to say each meal contains tasteless ingredients and will just sit in the bowl, the flavours provided from the high meat and fish content is enough to make any pet want for more. Layers is the newest collection of complementary recipes from Applaws, which consist of a unique wet food formula which is hard to resist. Each pot consists of either chicken or tuna, topped with one of four delicious ingredients to produce a unique layered effect, which is then covered in a soft, natural jelly. As the end of the year approaches it seems the days are much shorter as darkness looms much earlier in the evening. Although this makes riding later in the afternoon more hazardous, there is no reason why this should be stopped just due to low light conditions. Luckily there are products available which can help you stand out in poor conditions. Equisafety manufacture products specifically to promote safety when out riding or walking. Their hi viz clothing and accessories provide you with reflective, fluorescent panels which are sure to be seen during the winter evenings. This month we have seen the addition of a fluorescent Exercise Rug for your horse, as well as a number of products for horse and rider which have a number of LEDs inside so you will stick out like a sore thumb. The Flashing Tail Guard will ensure your horse is seen from behind, while the LED Leg/Arm Band and the LED Flashing Attachment can be placed in multiple positions on you and the horse, whichever suits you best. There is also a Flashing Hat Band that can be attached directly to your riding hat. Small animal owners will be spoilt for choice when they see the new additions to the site from Small 'N' Furry this month. The brand comes from the company Sharples & Grant, who have been producing pet products since 2005, and continue to see their products being sought after due to innovation and high quality. Small 'N' Furry are their small pet division, and their products include a huge range of natural, exercise and chew toys. Flying Saucer is an exercise wheel unlike any we have seen before, the Alf 'a' Swing provides a game which ensures you pet has to work for the enjoyable treat, the Fruit 'n' Nut is a natural wooden chew with a hidden nut, and the Loof 'a' Tunnel provides a place to run through, chew and hide in. These are just a few choices from the range, there is much more to peruse this month on the VioVet website.